Those who visit Lake Tahoe rarely leave without falling under the spell of the region’s natural beauty. Most people would nod to The Lake’s aquatic expanse of blue as the seductress, but persons of one particular breed may credit a different element. The individuals in this category are rock climbers. Since its development nearly 50 years ago, the climbing area known as Donner Summit has been the object of affection for climbers throughout the U.S. and beyond. Donner Summit isn’t a large climbing area in terms of route length, acreage and number of climbs, but what it doesn’t offer in quantity it makes up for in quality: quality rock, quality views and quality routes. 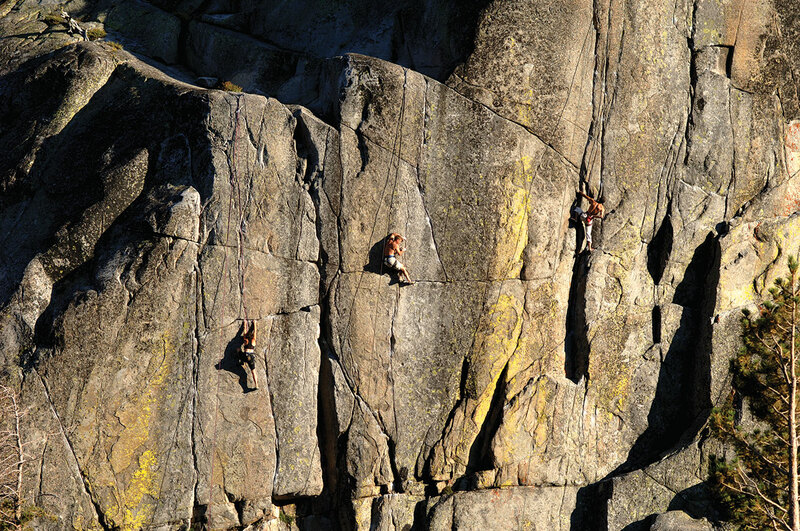 Located on several towering roadside crags along Old Highway 40 between Truckee and Norden, Donner’s remarkable verticality and finely textured granite walls contribute to its popularity as a climbing destination. By climbing standards, the granite is as good as it gets. The glacially sculpted rock formations make up one of the most northerly bastions of Sierra Nevada granite known globally by climbers the way Napa Valley grapes are known to wine devotees. Donner Summit’s predictably good weather during the May through October climbing season is also a draw, as is its easy access: The base of many Donner climbs can be reached in five minutes (or less) from Old Highway 40. The historical documentation of a climbing area is often tenuous—particularly for areas developed before the Internet, like Donner Summit. The first roped ascents generally are reported through word of mouth, and what constitutes a “first ascent” is open for interpretation. Typically, an informal core team of early players carve out such definitions over time as the unofficial process of formulating an area’s traditions, ethics and ratings unfolds. Eventually, guidebooks are published and guiding operations are established, providing new vehicles for communication. Donner’s first of six guidebooks was published in 1973; Alpine Skills International (Editor’s note: Heidi Pesterfield guides for ASI), the area’s first guide service, opened in 1979 and still operates today. Donner Summit’s earliest development occurred in the late 1960s, though the bulk of its routes were established primarily by a core group of local climbers in the ’70s. While these efforts can be attributed to numerous climbers, two prolific contributors to the area’s early development are Carson City’s Max Jones and Truckee’s Gary Allan. During a recent conversation at Incline Village’s Tunnel Creek Station, Jones and Allan described their involvement in the area’s development and comment on changes they’ve witnessed through the years. Allan, 58, is an intense, brawny character with boyish yet handsomely aged blocky features, blondish-gray hair and a formidable personality. Originally from New York, where he learned to climb in the Adirondacks, Allan met Jones at Donner Summit in 1975, where the two discovered they had a common appetite for previously unclimbed rock. They got busy establishing hundreds of new routes, many of which helped earn Donner Summit the stellar reputation it enjoys today. Jones was responsible for establishing the majority of routes on Donner Summit’s Snowshed Wall. A two-time national mountain bike champion and co-owner of Incline Village’s Flume Trail Bikes, he recalls first attempting the routes via top-rope, meaning the rope is secured from the top. 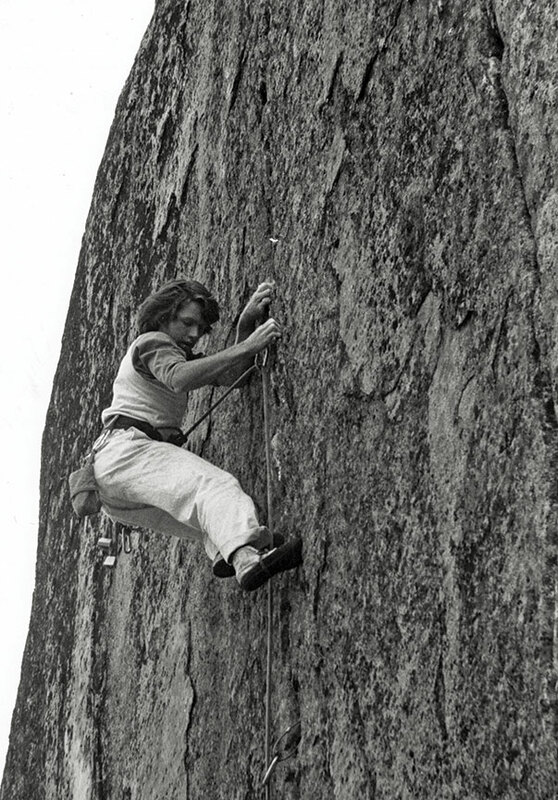 When Jones finally ascended the routes via lead climbing (a more challenging form of ascent occurring from the ground up), he did so in shoes without modern “sticky” rubber and using “old-style” gear. This is a notable feat, as today’s more advanced equipment make lead climbing relatively easier. Roped climbing at Donner Summit evolved with changes in climbing worldwide. These include the gradual improvement of climbing equipment beginning in the 1970s and the rise of rappelling tactics to establish bolted routes starting in the late 1980s. Both led to a steady increase of difficulty ratings (from 5.9 to today’s 5.15) as routes previously considered impossible were established. One of the most notable changes transpiring in Donner Summit climbing history to date is the pending acquisition and protection of ten acres of privately owned land upon which a significant portion of the climbing area exists. In March, the Donner Truckee Land Trust (TDLT) and the Access Fund, a national climbing advocacy organization, signed an agreement with a private landowner to purchase a significant portion of Donner Summit climbing area. The ten-acre parcel, which includes the historic and popular Black Wall, is being purchased by the land trust in partnership with the Access Fund, who will assume liability by leasing the land from TDLT through a recreation lease. Allan is project manager of the Save Donner Climbing campaign, which was created to raise the necessary capital. “As climbers have come together to help preserve the area for future generations, a local climbing coalition of sorts has formed for the first time—it’s very exciting,” says Allan of the campaign, which is currently fundraising. Getting involved in the Donner Summit preservation efforts stems from wanting to give back to the community, a desire heightened a few years ago by the passing of an early climbing mentor who inspired him to establish new routes, Allan says. Several days after meeting at the café, Allan and Jones hit the flanks of Snowshed on a Sunday afternoon. Donner is generally swarming with climbers on the weekends and sometimes queues form at the base of popular routes. But the day is unusually quiet; only one other party is present. Allan and Jones climb with the astonishing ease and finesse of younger men, making the hardest moves look easy and transitioning efficiently from one route to the next. In a few hours they climb at least a half-dozen routes. Neither shows signs of fatigue as the sun descends behind the peaks and the wind picks up and whips through the summit notch. While other active Baby Boomers in the Basin load their golf clubs into their vehicles or put their paddleboards on their cars, these characters, members of that “other breed”—the ones with the intense look in their eyes—rappel off a steep roadside buttress, inspect their bloody knuckles and muscle their heavy packs onto their backs for the hike to the car. For more information about Save Donner Climbing, visit www.savedonnerclimbing.org. Heidi Pesterfield is a freelance writer living in Tahoe Vista. 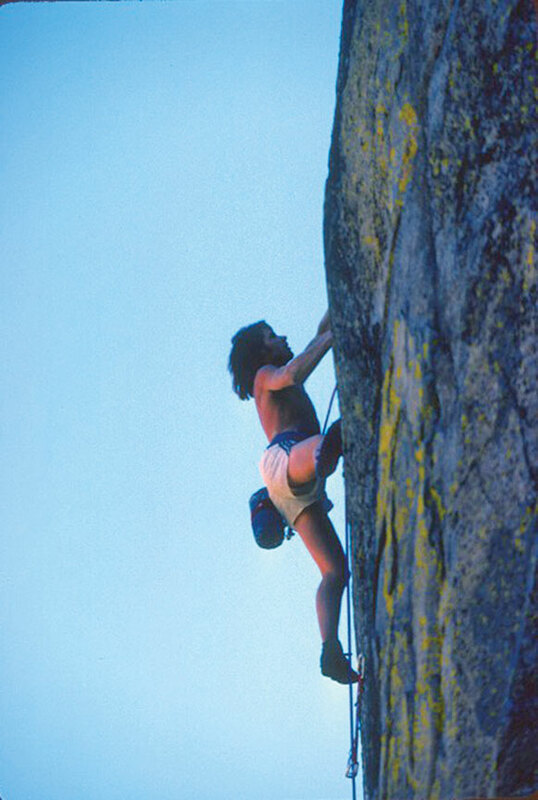 She is the author of Traditional Lead Climbing (Wilderness Press) and a veteran climbing guide for ASI.